I just have to share something with you. The other day Jeffie, Rudy and Rosie and I were thrilled to get a certain package in the mail. That package was from our buddies over at Sand Spring Chesapeakes: Gambler, Glory, Nellie and JoAnn. 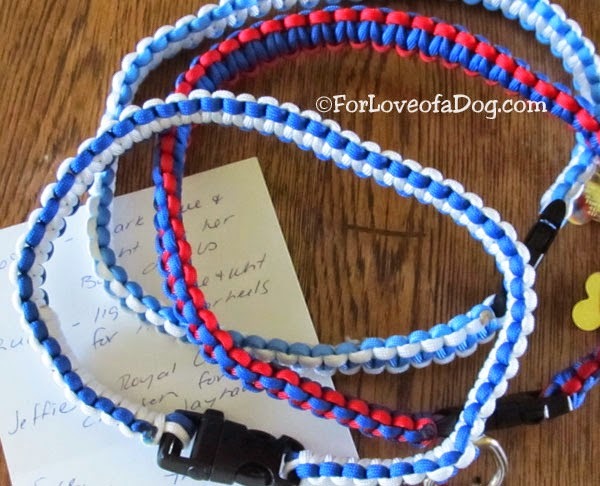 Though JoAnn said she was sending Jeffie a birthday gift, just look at these three amazing dog collars! I think Rosie looks fantastic in her new collar! 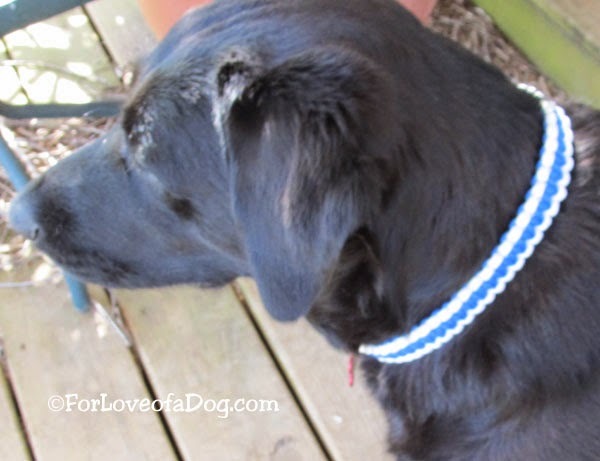 but collars just don't show up well on the hairy guy! now that they're looking so sharp! Don't you just love it?! I do! They're so sturdy, well made and beautiful! Thank you so much, JoAnn! In other news... I think we had 2 days of spring here and they included tornado warning.. We've now gone from stormy to temperatures in the upper 80's / lower 90's. The dogs don't know what to think. 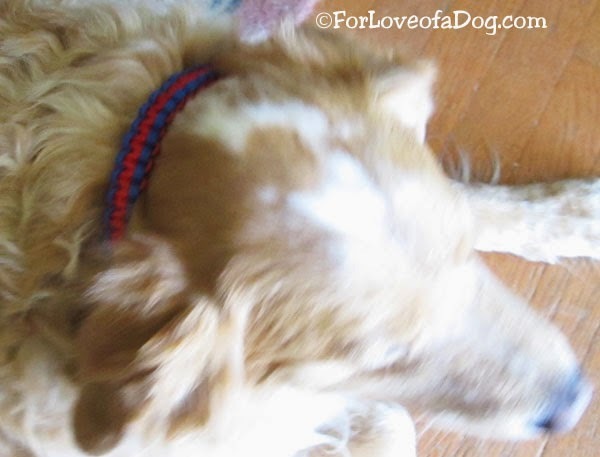 First it was too dark to take photos of the new collars, then it became so hot the dogs didn't want to cooperate at all. Today I'm actually contemplating turning on the AC. Remember that photo of my cherry tree I shared on May Day? That night hail took every single one of the blossoms! Sigh... Between late ice storms, wicked thunderstorms and hail, no flowering tree, shrub or flower blossom survived longer than a day or two around here. Oh well. I think we'll be swimming early this year! 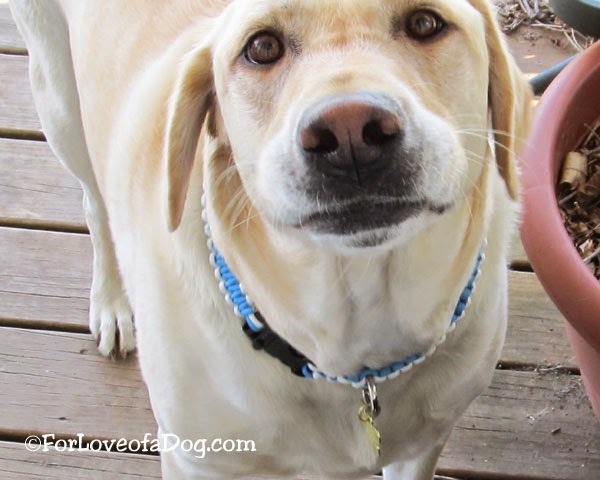 AND if you missed my Give Cancer the Paw blog post, you missed my video of my heart dog, Lucy, with my Randy Barr original dog song Lucy and Me. Here it is again and at the end you'll see how you can get a song for your own dog and help canine cancer victims, too. 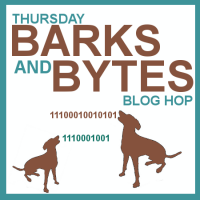 I'm joining the Barks and Bytes blog hop today hosted by 2 Brown Dawgs and Heart Like a Dog Grab the badge and join in the fun! Those collars look lovely, but collars are more or less invisible when I'm wearing them! What a great song...she was so pretty, reminds me of my first Lab, Maxine. Nice work on those collars - those are cool. Wow Sue, that was awesome. I know we talked about how Sampson reminds you of Lucy, but WOW. Those puppy photos and certain ways she laid or sat. Holy smokes. I'm glad you have such an awesome video to honor Lucy, and thank you for joining the blog hop. What a thoughtful gift. Sorry about your trees. Its so sad when you look forward to the blooms only to have them disapear before you get to appreciate them. You are so welcome Sue. They look fabulous on the doggies. I'm glad they fit well too. It is hard to make buckle and hopes they fit since you can't adjust them. Aw that is so sweet! The collars look great. It's rainy here today... but it's been pretty sunny and hot out lately so I don't mind. Oh wow those are super cute!!!! 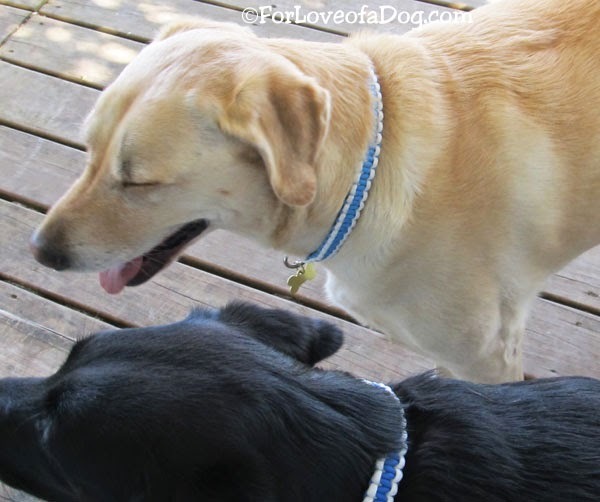 The collars are so beautiful....how sweet of JoAnn!! Your weather has been just awful! We actually got the dogs' pool out today, it's quite warm for once. But they say it will only last for a couple days and then it will cool off again. I hope yours settles down soon....I hate it when it jumps from cold to hot in one day, and then we're not even prepared for it!